During the 2018-2019 academic year, the Institute for Digital Arts & Humanities will explore the theme: Marking the Arts and Humanities. By extending last year’s theme on making, we hope to interweave making with marking to create countless opportunities to critically engage the sources and processes that comprise a layered approach to the theories and praxes underlining the digital arts and humanities. Project Debater is the first AI system that can debate humans on complex topics. The goal is to help people build persuasive arguments and make well-informed decisions. The project has spanned over 5 years and has helped advance the field of argumentation mining, e.g., argument detection and argument stance classification. Charles Jochim will discuss generally his involvement in the stance classification effort, and specifically look at how he handled sentiment in idiomatic expressions with a new lexicon. The Indiana University Libraries has a gold mine of digital collections that can be used for computational analysis. 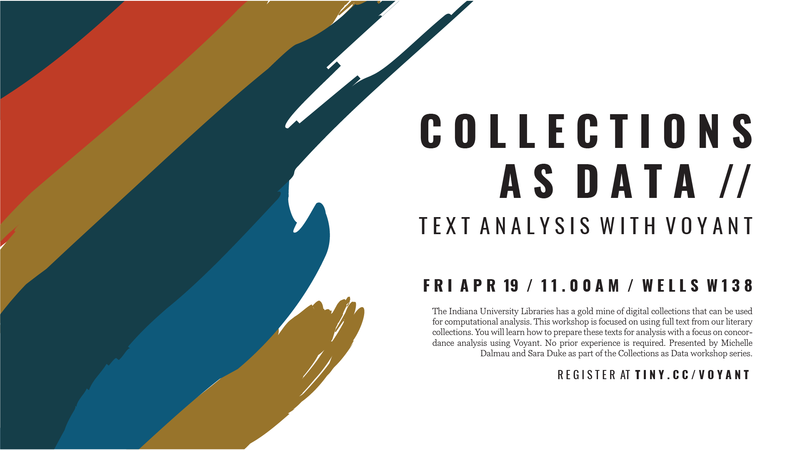 This workshop is focused on using full text from our literary collections. You will learn how to prepare these texts for analysis with a focus on concordance analysis using Voyant. No prior experience is required. Looking for a previous workshop? Missed one of our guest speaker's talks? When possible, we record and publish our talks and workshops online through IU ScholarWorks. Slides and supporting materials are also available. If you are looking for an event and don't see it here, please contact us at idah@indiana.edu -- in instances where a speaker will not grant us permission to make their work publicly available, we can sometimes provide recordings on an individual basis.